The Grand River starts near Dundalk and flows south through a watershed of 6,800 square kilometers. It is home to close to one million people and includes the cities of Brantford, Cambridge, Guelph, Kitchener and Waterloo. Cities, towns and villages make up about five percent of the land. It is also an intensive agricultural area, with farms making up about 70 percent of the watershed. Agricultural runoff can therefore have a significant impact on water quality for downstream water users. That’s particularly important because the river supplies drinking water to about half a million people in the watershed. 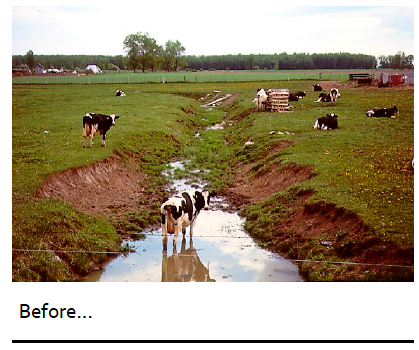 20 years ago, the Region of Waterloo worked with local farm organizations including OSCIA to develop the Rural Water Quality Program (RWQP), a municipally-funded program that supports producers who wish to implement practices to improve or protect water quality. The rationale is simple: It’s cheaper to keep sediment and nutrients on the land than it is to remove them from the water at the municipal water treatment plant. Representatives of farm organizations were instrumental in program development and continue to provide input to the program. Wellington County adopted a program in 1999 followed by other upper tier municipalities in the Grand River watershed, resulting in RWQP programming available in most parts of the watershed, including Brant, Haldimand and Dufferin. The Grand River Conservation Authority (GRCA) delivers the program to watershed landowners on behalf of the municipal partners. Outside the Grand watershed, the program is delivered by the local conservation authority. 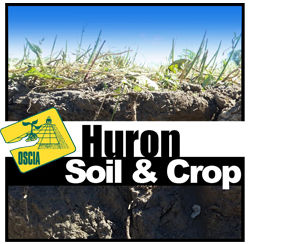 Eligible projects in this voluntary program include erosion control projects, cover crops, tree planting, watercourse fencing, and well plugging projects. Grant rates and project categories vary by county. Applications are reviewed by a local producer peer review committee that selects those projects that have the highest likelihood of improving water quality for downstream water users. An Environmental Farm Plan is required to be eligible for RWQP grants. The response from producers has been enthusiastic. From 1998 to May 2018, over 4,900 RWQP projects have been completed on farms across the Grand River watershed. That’s over $15 million in grants paid out to producers to support a capital investment of over $45 million invested in drinking water protection. Ken Hunsberger, president of the Waterloo Federation of Agriculture, farms near St. Agatha. 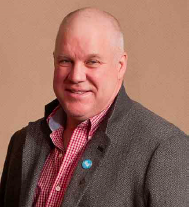 He has been involved in the development and running of RWQP since early discussions began in 1997. “It’s almost amazing that now, 20 years later, the program is still going as strong as ever, and it’s also as relevant as ever” he says. “It’s been a great example of a program where incentive money creates motivation for producers to make an investment. It’s so much better than using legislation as a stick to encourage a change in attitude”. Twenty years after the inception of the program in Waterloo Region, the changes on the landscape are obvious. 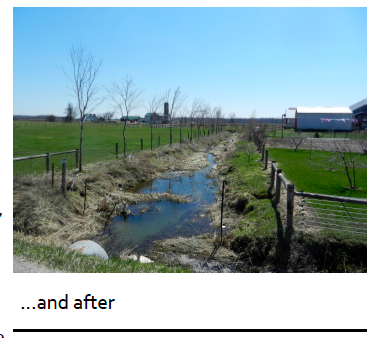 These before/after photos show the changes observed on a typical stream fencing/riparian buffer planting project on a Nith River tributary in Waterloo Region. The first photo was taken in 2001, prior to fencing and tree planting which occurred that spring. The second photo shows the same site in 2013. The streambanks have stabilized, fish and wildlife populations have increased, and the trees are thriving. Thousands of producers have participated in this voluntary program. It’s clear that they see benefits to implementing water quality improvement projects on their farms. However, downstream water users have also benefitted in terms of improved protection for drinking water. Successful partnerships are a beautiful thing! For more information on applying to the Grand’s Rural Water Quality Program, please visit the website or call the GRCA at 519-621-2761. Huron County continues grant support for water quality projects by landowners, community groups through Huron Clean Water Project The County of Huron is investing in the local environment by continuing its funding support, in 2018, for the Huron County Clean Water Project. A new brochure for the project is ready and is to be posted online at abca.ca, mvca.on.ca, and huroncounty.ca. The new brochure provides the 17 categories of grants available to Huron County landowners and community groups; maximum grant levels; and contact names and information. To learn about grant rates and eligible projects you are invited to phone Maitland Conservation at 519-335-3557 or Ausable Bayfield Conservation at 519-235-2610 or toll-free 1-888-286-2610. You may also find out more online at huroncounty.ca or mvca.on.ca or abca.ca. Since 2004, Huron County landowners and community groups have, with support of Huron County Clean Water Project, completed close to 2,700 protects to protect local water quality. The total value of the completed projects is more than $10 million. Last year, $1 million worth of environmental projects were completed through the program. That’s good for water quality and good for the economy, according to staff delivering the program. “Projects help to control erosion, preserve topsoil, keep nutrients on the land and out of creeks, and provide economic benefits as well,” said Kate Monk, Manager of Stewardship, Land and Education at Ausable Bayfield Conservation Authority (ABCA). The program has done a lot to protect groundwater with more than 500 unused or abandoned wells properly decommissioned with support of the county program. There’s still more work to be done to further protect the groundwater for local wells, according to Monk. “There are still dug wells in the countryside and even in towns and villages, that haven’t been used in decades,” Monk said. “These wells are direct connections to the shallow aquifer and anything that gets into the well can pollute drinking water.” People in Huron County can receive up to $750 per well to help with the costs of hiring a well contractor to properly decommission the well. Cover crops are catching on with agricultural producers and the Huron County Clean Water Project helps cover the costs. “Cover crops have really proved their worth during the winter rainfall events by holding the soil,” said Doug Hocking, Water Quality Specialist at Maitland Valley Conservation Authority (MVCA). The $10 per acre incentive helps producers to try different cover crop mixtures to see what works best for them to improve their soils and control erosion. Grant categories include: erosion control measures; special projects; rural stormwater management and wetland creation; clean water diversion; fragile land retirement; livestock fencing; manure storage decommissioning; cover crop incentives; community projects; forest management plans and woodlot enhancement; composting toilets and on-site wastewater inspections; wellhead protection; well decommissioning; stewardship guide implementation; wetland restoration incentives; municipal wellhead protection area reforestation; and living snow fences. The program’s success has three pillars: stable funding from the county, environmental knowledge and one-to-one assistance by the conservation authorities and, most importantly, landowner participation. “If landowners weren’t willing to do projects, the program wouldn’t exist,” Monk said. 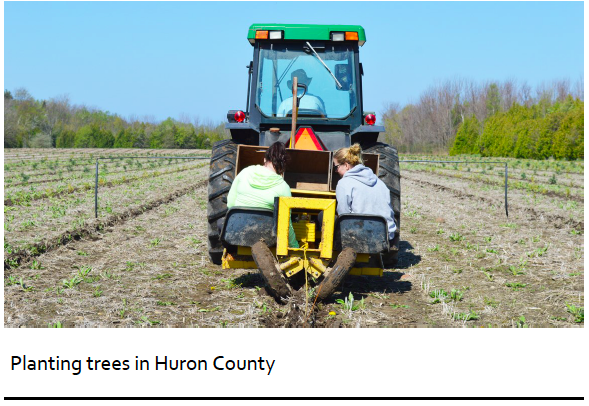 Huron County property owners have, with the support of the county program: completed more than 700 tree planting projects; planted more than 50 acres per year in trees; established 170 kilometres of windbreaks; planted 10,000 acres of cover crops in the first two years of the cover crop incentive category; decommissioned more than 500 unused wells and more than 90 liquid manure storages; fenced cattle out of 20 kilometres of streams; completed more than 200 erosion control projects; completed more than 80 forest management plans; and upgraded more than 380 private wells. The Huron County Clean Water Project is funded by the County of Huron. Service delivery is provided by the Maitland Valley and Ausable Bayfield conservation authorities. Landowners may call by phone to apply. Are you the next OSCIA Forage Master? Listowel area dairy farmer Doug Johnson was the winner of the 2018 Forage Master competition — let’s keep the title in Heartland Region! Submit your entry by July 15 to be considered for this award program. Read more on the OSCIA website. Can double cropping winter canola and soybean kill two birds with one stone? 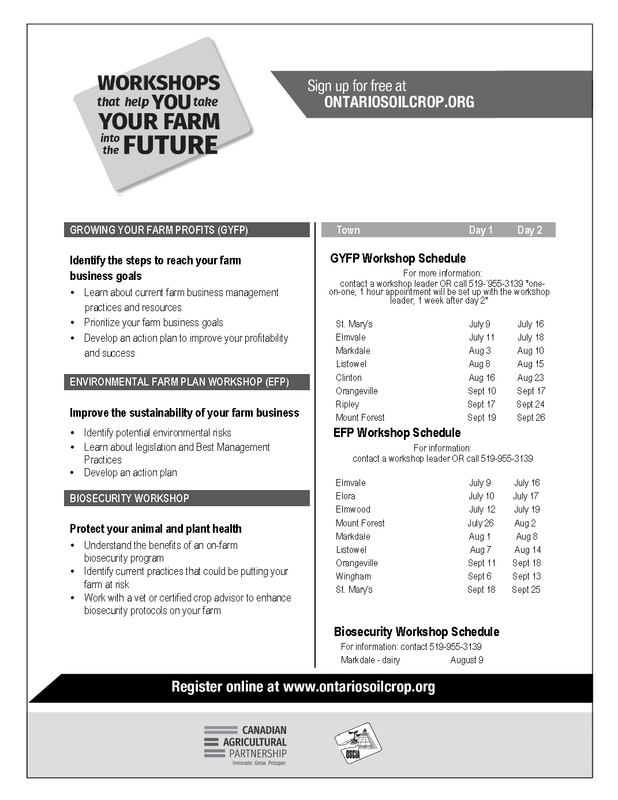 July 5: Ontario Forage Expo 2018 Brakke Farm Inc., 3213339 Concession 6/7 in Grand Valley, ON. July 10: Perth SCIA Twilight Tailgate Tour. Food and tour start at Bradi Farms, 4100 Line 42 Perth East (43.4270091,-80.9526334). Pork on a bun 5:00-5:45 p.m.; Car tour begins at 5:45 p.m.
July 10-12: Waterloo SCIA bus trip to Quebec.